I had an encounter with wild parsnip (Pastinica sativa) Identification Key September 4th in the field by the parking lot for Chickering Bog, at the corner of Lightening Ridge and George roads in Calais VT.
Not knowing much about this plant, I had contact without knowing I had brushed it. I know a lot more now. Not everyone is so sensitive. It contains furocoumarins which cause phyto-photo-dermatitis or plant-sun-skin inflammation. When you get the plant juice on you, the rash does not begin until it is activated by sunlight. In my case I was not aware I had contacted the plant and went out the next day (Sep. 5th Labor Day) and got lots of sunshine. A couple spots started to develop that day. I’d also had time to spread the juice further around my body with contact on my clothes, hands, camera case , steering wheel etc. The photos will tell a thousand word story. 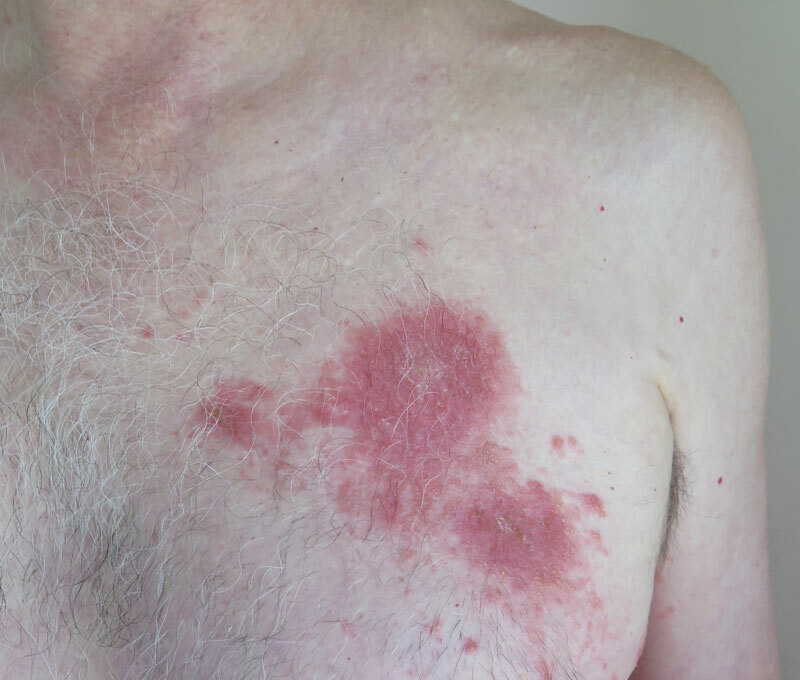 The rash continued to get worse over 9-10 days. I took a short course of Prednisone augmented by various herbal treatments topically and internally. I will not be specific as you should contact your health care professionals. 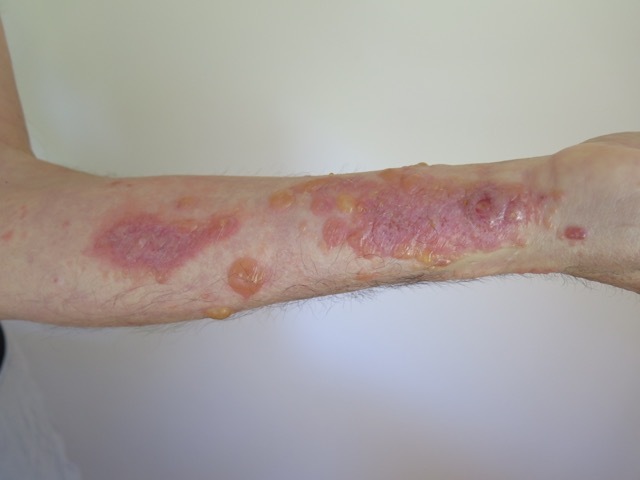 Treatment is for 2nd degree burns and is not the same as for poison ivy although there may be some overlap. I also do not have enough praise for our local herbalists who have a wealth of knowledge and experience. I highly recommend cultivating and utilizing this branch of health-care options. Please note that if you have a serious reaction and it gets in your eyes, there is a risk of blindness. I am including photos of the plants around the area mentioned above. The plants shown are on the road but you can see others in the field. Also, at the time of contact the plants were seeding and mostly brown on top with green stems. Obviously still quite potent. I have not see a lot of this plant around, but I would highly recommend becoming familiar with it. It seems to be restricted to open fields and road-sides. The upside is that learning to identify even a single new plant enhances your relationship with habitat in manifold ways. These are the best websites I found with more information and photos of various stages of growth. If humankind is to recover its balance on the Earth I’m convinced that it will require a profound rekindling of our collective love for and intimacy with nature. It is, of course, impossible, despite our best efforts, to separate ourselves from nature; it is writ in our DNA. However, we have gone very far down the road of denial and exploitation. About two years ago I was invited by some dear friends to attend a family day at EarthWalk which their son attends. I was very taken with the program and was honored to be invited to participate as an elder. I was never told what the qualifications for being an “elder” are, but from my side, coming away from each visit filled with kinship and a smile on my face are all I need. Much has been written about the benefits of immersing children in wild nature. My hunch is that most people still view the idea as an amendment to real life. To me, regular, near daily immersion in nature is as essential as food. EarthWalk is exactly the kind of program necessary to rekindle the tinder of Earth-based knowledge, skill and community, so that we may yet again walk in balance. The Village School program is for ages 7-12 with kids attending one day a week through the school year. The Teen Land project is for ages 13-17, again with one day a week attendance. There are a variety of summer programs, including mentor training. The following five photos show the Village School ritual Drum-stalk in which three groups are blindfolded, led to a distance and make their way blindfolded, individually and silently, to a drum-beater who is stationary in an undisclosed location. As I approach the Fitch-Robert sugar-house, steam rolling out the vents; earth, wood, water, fire, metal and humans are working in concert and I hear gentle conversation coming from within. I bid greetings to Judy and Bernard and am glad for a warm welcome from them and the arch (fire-box) on a crisp sunny day. Sugaring demands steady concentration, and at times quick action, so I try to stay out of the way, as they watch carefully, making fine-tuning adjustments as the refinement from sap to syrup evolves. Bernard and Judy’s sense of humor is infectious and we talk and joke, always with half an eyeball on the pans, and frequent checks of the specific gravity. Later, in a less demanding moment, we sit while the arch murmurs peacefully with a constant exhalation of steam, punctuated by engaging or comic stories from Stan. The local sap gathering ended about a week ago for the Fitches, as temperatures reluctantly refused to go below freezing, shutting off the sap flow, at least for bucket collecting practicality. Alternating freezing nights with above freezing days is a key element to sap flow. It was a short season, getting a late start, as winter hung on by its frosty claws. The sugar season endures for a year in the gallons of ambery bliss stored in our cellar and tippled out until next March. There are a few hold-outs, in our locale, to the old-timey bucket and gather method of collecting the sap, with straightforward boiling hardware. The Fitches have have done this going back to 1907. I happened to chance by one day when wood was being moved into the sugar house. A line of family and friends formed and Renée, Liam and Luca found that moving smallish chunks through the air added a flair of excitement to the rhythm. Can you spot the two sticks in mid-air? The modern Maple way involves kilometers of unsightly tubing, reverse-osmosis gizmos, vacuum equipage and all manner of hands-off efficiencies. Far be it from me to critique any sugarers’ means of livelihood in these lean times but for shear earthy pleasure (at least from this dilettante’s perspective) I’ll take the home-spun way that has served the Fitch-Robert family for a century. Eyesore, remaining all year long. The only thing that I would add this year is what an unpredictable and at times challenging winter it’s been so far. The first two photos below are from mid-December’s ice and frozen- clinging-snow storm resulting in huge power losses but incomparable beauty over five or six days. The other photos are from years past. My other challenge so far was a bout of allergy to our Christmas (Solstice) tree, a Balsam Fir, which subsequently morphed into a wicked head/chest cold. I guess I just wasn’t giving it enough respect. I shall henceforth try harder…..